Over the summer, it occurred to me that History class should be like the hit television show Law and Order. 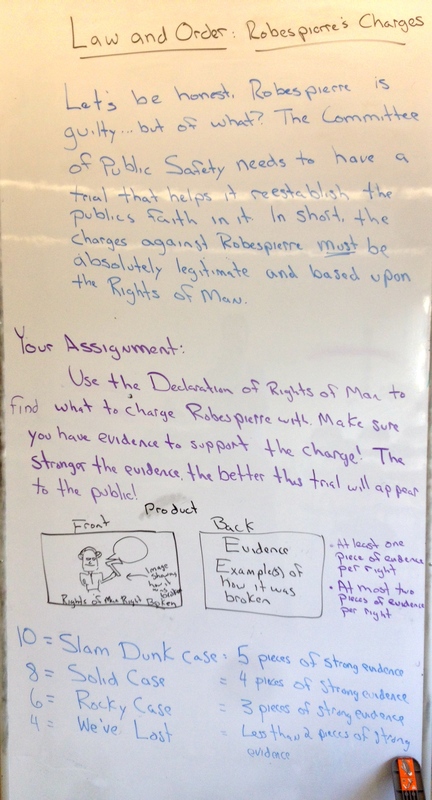 So after noticing that many of my students were not using evidence on a prior assignment (using the Declaration of the Rights of Man), I created this assignment to reinforce the necessity of using evidence in history. Let’s be honest, Robespierre is guilty…but of what? The Committee of Public Safety needs to have a trial to restore the public’s faith in the French government. The charges against Robespierre MUST be absolutely legitimate and based upon the Rights of Man. This is my 8 foot vertical whiteboard on wheels! This probably was my favorite classroom feature until I learned that I could use Expo Markers on the windows. Now it’s my second favorite feature (until I get a fireplace). Use the Declaration to the Rights of Man to find what to charge Robespierre. Make sure you have evidence to support the charge! The stronger the evidence, the better the trial will appear to the public. On the front, students write the article broken and draw an image of Robespierre breaking it. On the back, students write up to two ways that Robespierre violated the specific right. On the front, you must have the right that Robespierre is guilty of and a picture of how Robespierre broke it. On the back, you must have one or two strong pieces of evidence that supports the charge. This assignment did exactly what I wanted it to do – stress the importance of using evidence. Plus it got students to interact with the Declaration of the Rights of Man in another way (and possibly more meaningful way)! I could have had students walk through the each others evidence and discuss what made for a compelling case…next year! This year, students used their textbook to collect evidence against Robespierre, but I may seek out secondary sources for next year. 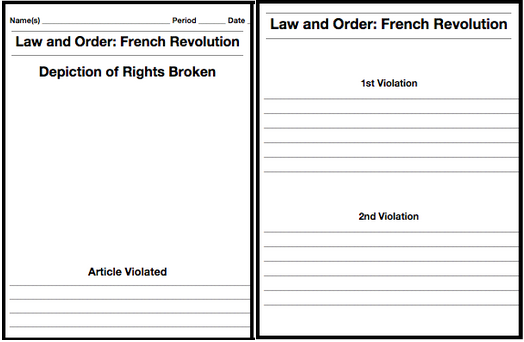 This entry was posted in Common Core, History and tagged education, History, Law and Order, Robespierre, Social Studies. Bookmark the permalink. I love history, and I love good teaching. This is the kind of historical analysis and evaluation that make history a meaningful class. The strongest compliment I can give, is that I would love to have my children in a class engaged in such activities. Rock on Michael. I like this idea a lot. As we are about to embark on the French Revolution, I will be posing this to my team as an idea. Thanks for the inspiration! Awesome! Really love the focus on evidence necessitating the careful reading of the Declaration of the Rights of Man.